Posted by Lorea Thomson on Friday, March 30th, 2018 at 3:08pm. The Tequesta, Ais, and Jaega native tribes were hunter-gatherers of Jupiter Island and the surrounding area during the 18th century when the Europeans arrived. Hobe Sound’s name derived from the Jaega, or the “Jobe” native people. The diverse array of plants on the Hobe Sound National Wildlife Refuge were used by early native American people as food, medicine, and tools. The U.S. 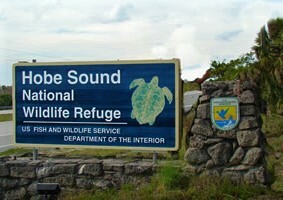 Fish and Wildlife notes that Hobe Sound National Wildlife Refuge was established September 30, 1969. It is a coastal refuge divided by the Indian River Lagoon into two separate tracts of land totaling over 1000 acres. With 735 acres located on Jupiter Island habitat is vital. The 300-acre mainland is sand pine scrub area and valued since more than 90 percent of this pine community has vanished to developmental growth. The sanctuary, in Hobe Sound, is home for nearly 40 species listed as either threatened, endangered, or of special concern. The unique beauty of Hobe Sound National Wildlife Refuge is the biodiversity located in the large remnant of sand pine scrub and 10 miles of mangrove communities along the Indian River Lagoon and the 3.5 miles of beaches on the Atlantic Ocean.